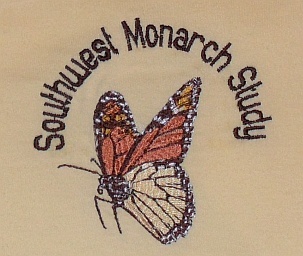 Just in time for the holidays - Southwest Monarch Study T-shirts! 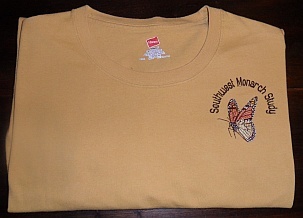 Joyce Peters, owner and designer at Custom Fashions, is offering designer Southwest Monarch Study T-shirts! 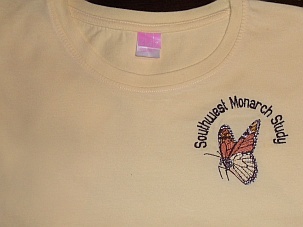 Each shirt is machine embroidered with a monarch butterfly including "Southwest Monarch Study" in a complimentary color. All prices quoted include tax but not shipping, if needed. Plus, Joyce will donate $2 for every shirt sold to the Southwest Monarch Study to defray costs of the tags and for recoveries in Mexico. 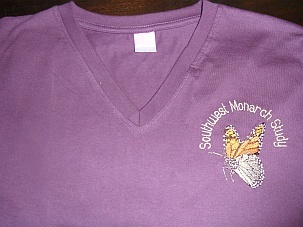 Women's 3/4 sleeve, V-neck T-shirt is also available in Banana or Eggplant for Small, Medium, Large and X-Large for $22 each. Men's T-shirts are available in comfort soft 100% pre-shrunk cotton in Gold Nugget, Fatigue Green or Maroon for $22 for sizes Small, Medium, Large and X-Large.